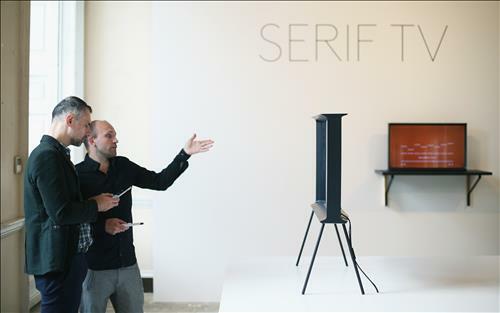 SEOUL, Sept. 23 (Korea Bizwire) – The Samsung Serif TV, a product resulting from collaboration between Samsung Electronics and furniture designers Ronan & Erwan Bouroullec, has been revealed at the London Design Festival. 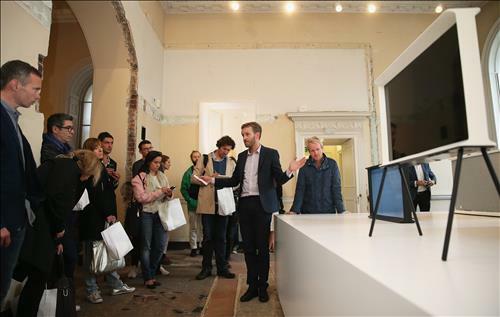 Samsung prepared a special exhibition at the always popular Somerset House, and will stage the Serif TV until September 27. The TV is the first electronic device designed by the Bouroullec brothers. Hailing from France, the brothers are famous for designs inspired by nature and filled with imagination. The new TV was inspired by typography, which studies the blank spaces and position of letters. Just like it, the TV was designed to interact with the surroundings so that it would blend in with a room regardless of its placement. Erwan Bouroullec commented that ideas from furniture design and high technology were combined together so that the TV could naturally blend into living spaces.